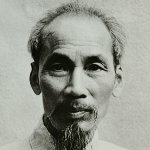 The Vietnamese annually celebrate Hồ Chí Minh's Birthday on May 19. He was an outstanding politician of the Democratic Republic of Vietnam and its first president. The birthday of Hồ Chí Minh is a very important holiday for the country. Hồ Chí Minh was born on May 19, 1980. In 1911 he started working on ship and left the county. He traveled to the USA, where he lived in New York and Boston, and to Great Britain. Starting from 1919 Minh lived in Paris, France, where he joined the group of the Vietnamese nationalists. Following World War I, the group petitioned for recognition of the civil rights of the Vietnamese people in French Indochina. In 1920 Minh entered the Socialist Party of France, but he gained to become a political leader only in the Soviet Union, where he studied at the Communist University of the Toilers of the East. Hồ Chí Minh returned to Vietnam in 1941 to lead the Viet Minh independence movement. He issued a Proclamation of Independence of the Democratic Republic of Vietnam on September 2, 1945, which led to the independence of Vietnam. Minh became its first prime minister and later the president. He headed North Vietnam till his death in 1969.